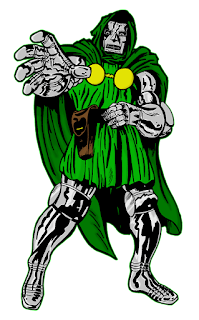 Matt C: To the wider world, Victor Von Doom is a negligible presence, a character that hasn’t translated into the mainstream thanks to some decidedly ropey, misjudged interpretations in the three officially released Fantastic Four movies. 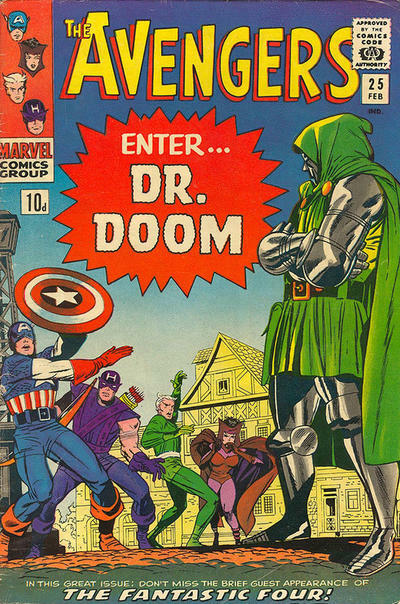 Those with more familiarity of the superhero genre on the printed page know better though: Doctor Doom is, arguably, Marvel’s greatest villain, and perhaps the greatest supervillain in comics. The son of Romani gypsies, Doom discovered his late mother’s arcane secrets during his youth and when enrolled in Empire State University attempted to combine science and magic to free her from Mephisto’s realm (basically Marvel’s version of Hell). Although fellow student Reed Richards tried to bring incorrect calculations to his attention, Victor ignored them, and the resulting accident put him on the path to becoming both the armour-clad dictator of the fictional Eastern European country, Latveria, and the Fantastic Four’s most dangerous and ingenious nemesis. Many of the covers he’s adorned over the last five decades have been limited in the poses displayed – more often than not a choice between arms folded or firing power bolts from his gauntlets – but there are still plenty of images to compile a set of ten covers that show Doom at his finest. The posing is a bit clumsy (what’s up with Doom’s right arm?) 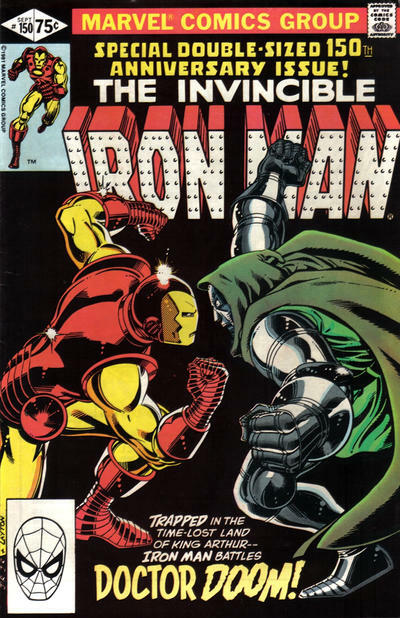 but it’s still a potent image, with the Armoured Avenger squaring off against the, well, Armoured Megalomaniac. Two towering super-powered titans clashing (along with their respective towering egos!) is something irresistible for any fanboy who spent their early years trying to figure out who would be victorious in various hero vs villain (or hero vs hero) punch-ups, and while that’s not really a primary concern for today’s more discerning (*ahem*) readership, I don’t think any true acolyte of the House of Ideas would be able to turn away from a Bronze Age match up like this. It’s a visual tease – because there’s no way Doom would ever be worthy, right? 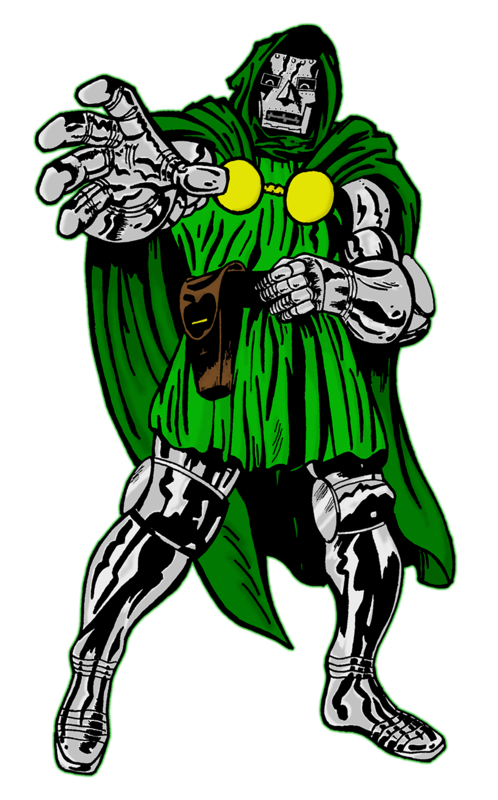 – and there’s an obvious simplicity in its design, but it still hits the spot for fans of Latveria’s most eligible bachelor. What makes it memorable probably relies heavily on prior knowledge of the character because only then would there be an understanding of why Doom possesses the audacity to think he would be able to lift the Thunder God’s trusty hammer, Mjolnir. The following issue actually sees him do it (on the cover at least – another tease) but this better captures the arrogance of the action. How to celebrate the defeat of your enemies? By raising a jewel-encrusted chalice over your unconscious foes, toasting your own victory. That’s how Doom rolls. And he gets the girl too (even though she happens to be unconscious as well). It’s typical Doom braggadocio and it’s another example of how best to present the villain on a cover, by displaying a part of his ego-driven personality, especially from his own POV. Arrogance filtered through evil genius is still arrogance, but somehow it becomes all that more alluring. In a change from the usual programme, here we find Victor Von Doom cowering in fear before a seemingly omnipotent Franklin Richards. It’s a successful, and memorable, cover image precisely because it’s the complete opposite of how Doom is usually portrayed. It’s not really an accurate representation of what occurs within the issue, and the focus is clearly on young Franklin (back when his latent powers were much more in the mix of ongoing Fantastic Four adventures) but as it affords us a different perspective on the Eastern European dictator (with an ‘expressive’ mask to boot) it makes the grade. Doom, towering above his most hated adversaries. It’s a bit of an obvious visual metaphor but it works brilliantly, mostly because John Byrne’s depiction of the armour-clad villain is so assured - the artist had an impressive knack of reinventing ideas that had a touch of corniness two decades after their inception and imbuing them with an urgency and grandiosity that always stays well away from self-parody. 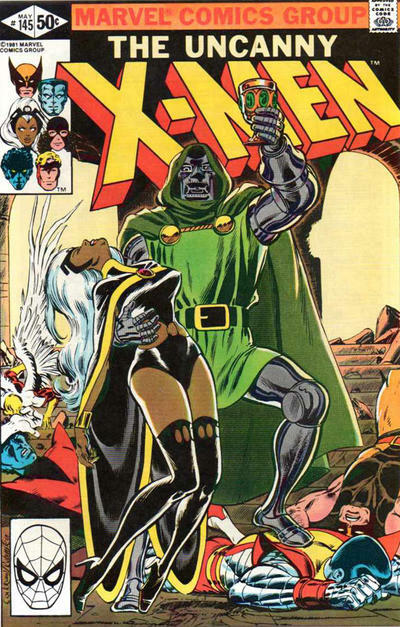 This issue also features the first appearance of the soon-to-be Doom impersonator Kristoff Vernard, which makes it hugely important in the history of the fictional despot. 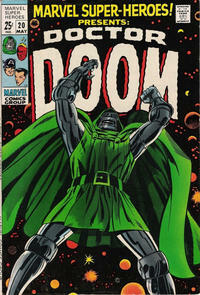 Doom, raging at the heavens. Or the cosmos. Or both. 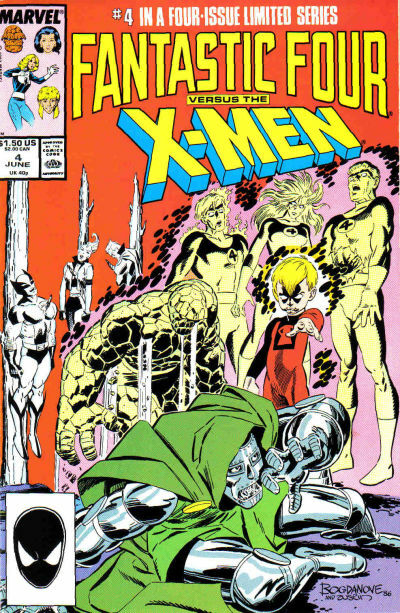 Usually there’s a certain amount of composure in cover images featuring Victor Von Doom, but here there’s a hint of… what? Rage? Anguish? Joy? With his concealed visage you’re never quite sure what’s going on behind the mask but it’s a striking image all the same, one that carries an air of something the good doctor frequently represses: emotion. If you’re going to pick a shot of Doom with his arms folded, looking imposing (and there are plenty to choose from! ), then why not his first cover appearance for Avengers, illustrated by the King himself, Jack Kirby, featuring the assemblage of Earth’s Mightiest Heroes at the time (Captain America, Hawkeye, Quicksilver and the Scarlett Witch) throwing the kind of shapes you’d expect to see at a ‘60s discotheque. The Fantastic Four have always been – and will always be – Doom’s nemeses of choice, but if you’re looking for someone to put in second place, the Avengers are a pretty good fit. 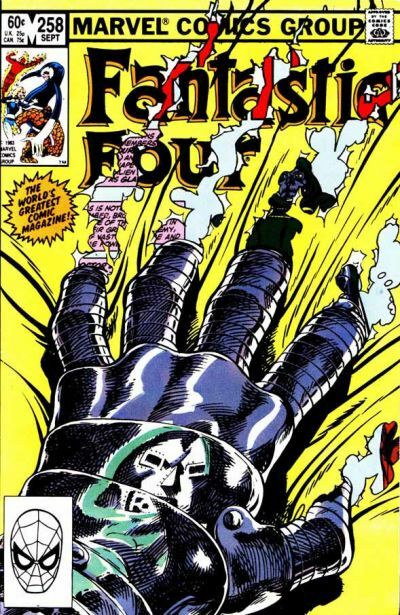 Another tremendously effective cover image from John Byrne, who manages to reveal so much about the character with only a metal gauntlet and the shimmering reflection upon it. 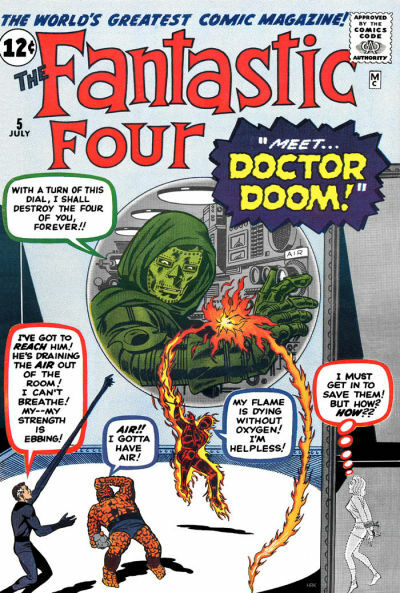 One of Doom’s primary motivations (more so in the early days, admittedly) was to destroy the Fantastic Four, and he gets off to a good start here by tearing through the cover of this issue. 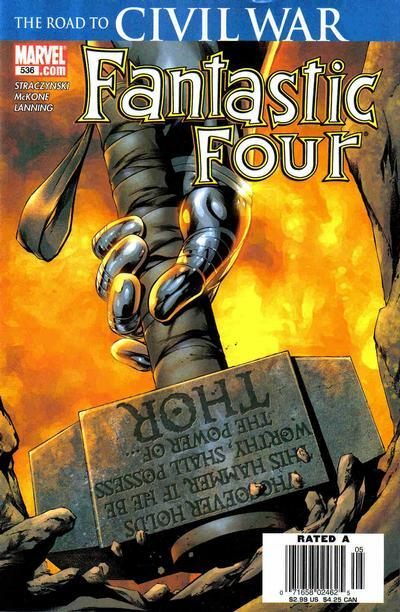 As well as nicely conveying his simmering hatred it also offers a nice throwback to the cover of Fantastic Four #92. The one that started it all. I guess it’s pretty bog-standard early Kirby (and when I say ‘early’ Kirby, I mean in the Marvel Age sense of the word) but even bog-standard Kirby had plenty of dazzling energy on display. 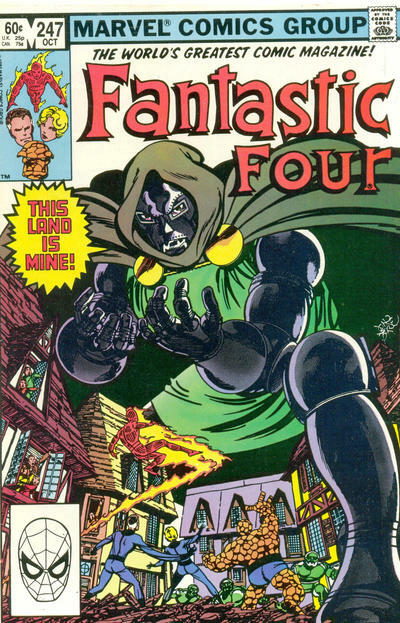 Doom may not look as ominous as he would later become (the backstory was yet to be defined), twirling generic knobs on on a hulking, nondescript machine, but the historical value of this image – introducing Marvel’s greatest villain to the world – makes it an absolutely essential, and timeless, one. For me, there could be no other winner. 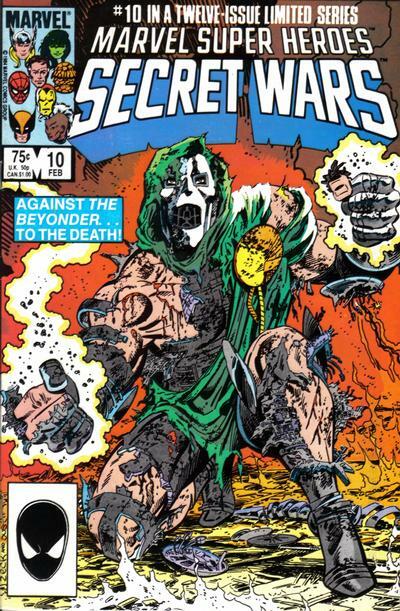 From hugely underrated ’80s cover maestro Mike Zeck comes an image that expertly encapsulates Doom’s determination within the confines of the story, but also boils down the essence of the character’s sheer indomitable will in on single burst of incendiary illustration. This is Doom at his most resilient, his arrogance turned up to 11, his belief in himself enabling him to achieve the impossible, even if his battered and bloody torso suggests otherwise. Doom is the personification of villainous resolve and hubris and this cover succeeds in distilling those traits in one, outstanding image.